I was recently asked by Old El Paso™ (in collaboration with Albertsons) to create a unique game day recipe featuring one of their products since they're available in my local Dallas Albertsons grocery store. In return for my time and creative effort, I'm being compensated financially for this post. 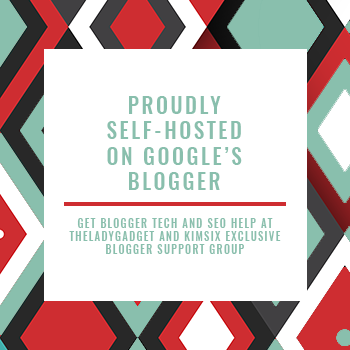 Thank you for allowing me to keep creating great content by supporting partnerships with brands I collaborate with on The Rising Spoon. As always, the opinions expressed here are 100% my own. Let's be honest, one of the best parts of hosting or attending a gathering is the food, right? (You obviously know where my priorities lie...ahem!) Some of my favorite party snacks growing up were cheese and veggie platters, sour cream & onion dip + potato chips, 7 layer bean dip, mozzarella sticks, potato skins, and canned black olives. If I was lucky, the host (or mom if I was at a friend's house for a sleepover) would make hot cheese dip, fondly called queso for short. This always consisted of two name brand ingredients melted together in the microwave or slow cooker: a rectangle of bright orange processed "cheese" + a can of diced tomatoes with chiles. Served with corn chips or tortilla chips, this queso dip disappeared lightning fast. And I have to admit, it was good. Okay, better than good. Frigging delicious. I loved this stuff back in the day! Eventually (as an adult) I got the opportunity to try a queso dip made with real cheese at a Tex-Mex restaurant. I was blown away at the difference! I could tell instantly that it was made with real cheese because it had a different and more complex flavor. 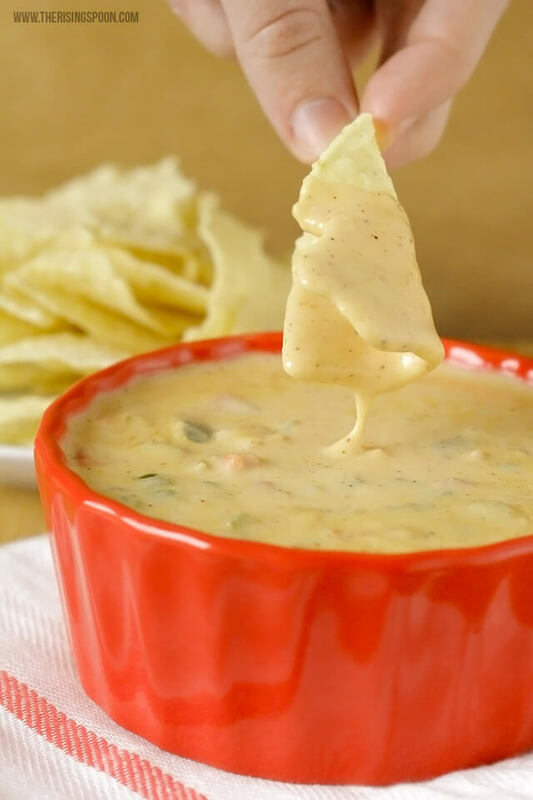 Most queso dips served in restaurants across the U.S. are made with industrial canned nacho cheese or the processed cheese product that I mentioned above, so it tastes the same every single time. 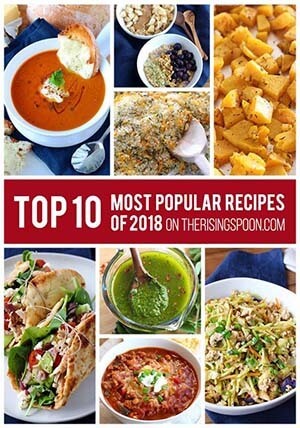 That's the thing about real food recipes...they use seasonal, fresh, and/or less processed ingredients so the taste is never exactly the same. I've been seeking out the good (real) stuff at restaurants ever since. Are they few and far between? Yes, but so worth it! Cause once you have a creamy cheese dip with real food ingredients, the canned stuff just doesn't compare. After consulting the Joy of Cooking + a slew of queso recipes across the internet that actually used real cheese (the V word is rampant), I whittled it down to a combination of ingredients that sounded good to me and prepared to give it a go. 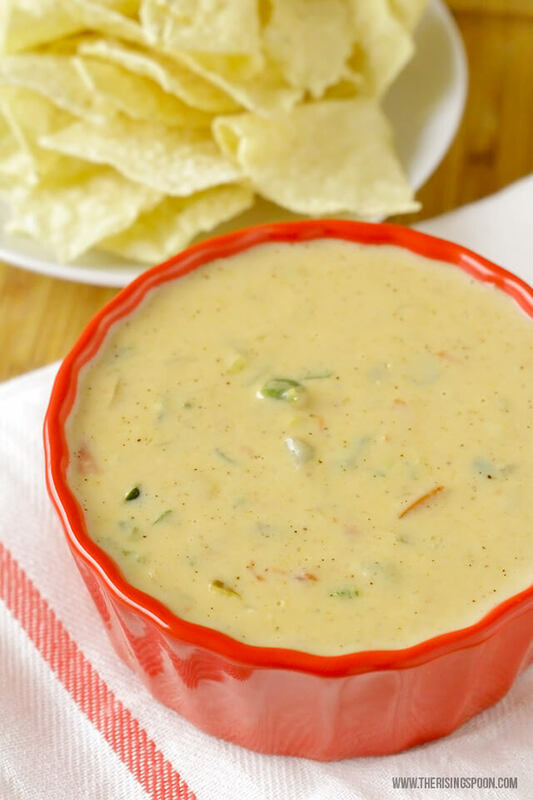 One thing that made me happy about this homemade queso recipe (that I'm sure you'll appreciate) is that it doesn't require any fancy ingredients. They're all easy to find and fairly inexpensive. I had most of them at home already, then grabbed the rest--Old El Paso™ chopped green chiles, fire-roasted diced tomatoes, two types of block cheese (grass-fed sharp cheddar and jalapeno jack), a lime, a poblano pepper + jalapeno pepper (a.k.a. chiles), and organic corn tortilla chips--at my local Albertsons grocery store here in Dallas. What does this mean? Good things! 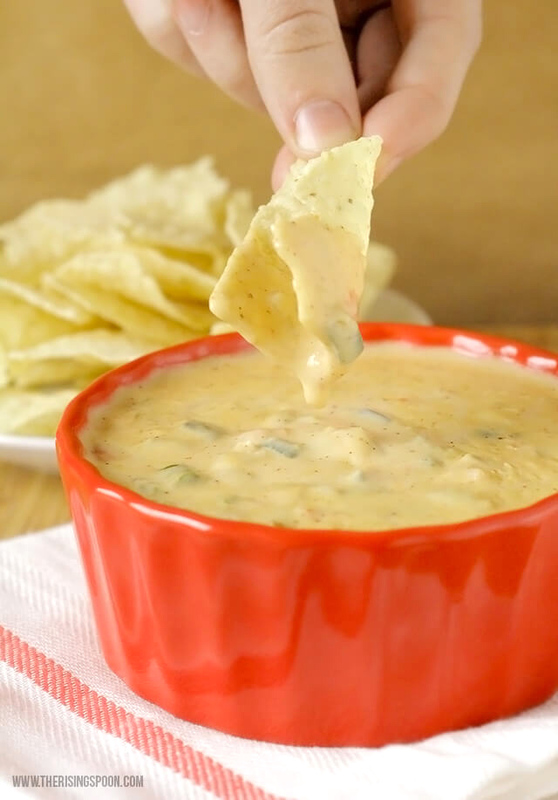 If you've got 30 minutes (or less) to spare, you can make a delicious, from-scratch queso dip at home. No need to rely on the jarred or canned stuff! And the best part? Your guests will happily gobble it up and you can feel good about feeding them delicious snacks with real food ingredients. 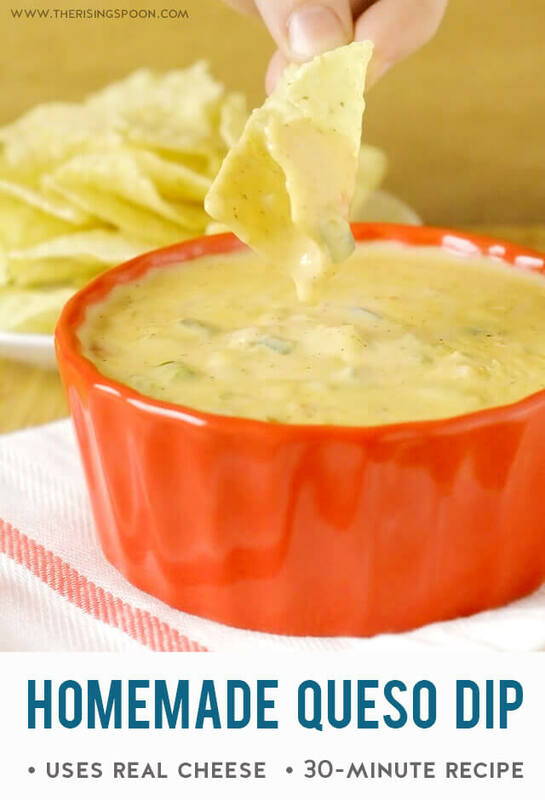 The basic technique for making a creamy homemade cheese dip or sauce is to start with a roux (cooking fat + thickener), slowly stir in a creamy liquid (milk, half & half, or heavy whipping cream), then even more slowly stir in small amounts of shredded cheese until everything is melted and silky smooth. 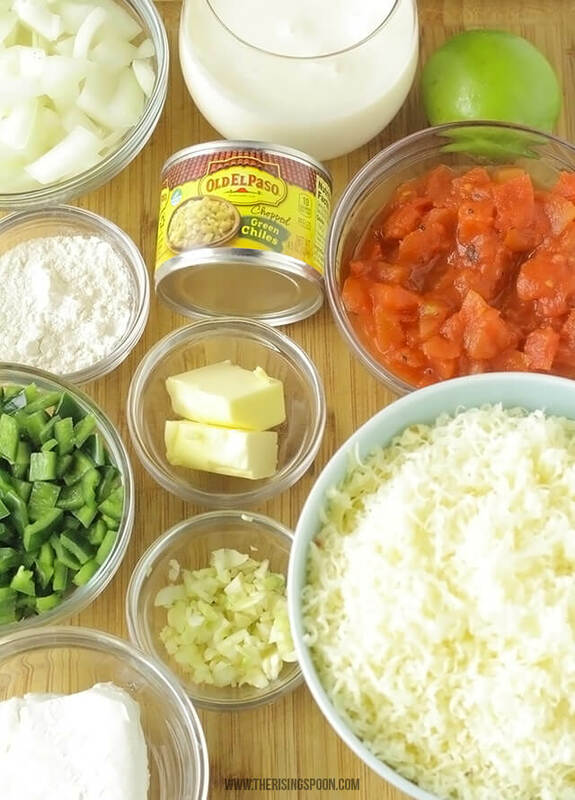 Essentially, you're creating a bechamel sauce (basic white sauce) then adding cheese + other mix-ins for extra flavor. Very easy stuff! If you've ever made a creamy homemade gravy this is a very similar process, but actually quicker. In this case, the cheese will quickly help to thicken the sauce into a dip, whereas gravy takes about 10-15 minutes to reduce and thicken up on the stove top with no added ingredients except seasonings. Once you stir in and melt all the cheese, you essentially have a basic queso (cheese) dip. However, the queso that we (as Americans) know and love, generally includes chiles and tomatoes + seasonings, as well. Technically this is called chile con queso (cheese with chiles); however we normally just refer to it by its shortened version: queso. The final flavor of your homemade queso depends on the types of cheeses, add-ins, and seasoning you use. In my case, I added cooked onion, mild chiles (poblano & jalapeno), garlic, fire-roasted tomatoes, cumin, chile powder, and sea salt to give the queso a balanced flavor. 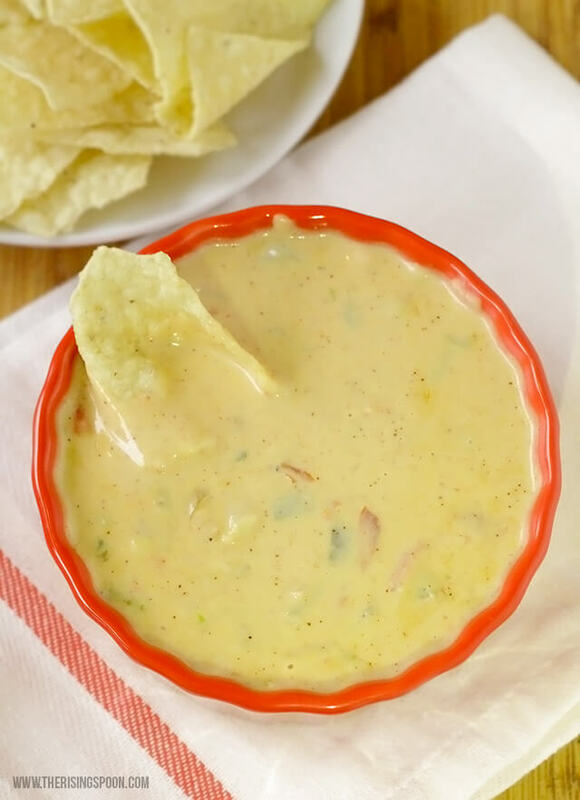 I typically just pour my queso into a ceramic bowl and dig straight in until it's gone, but if you're wanting to keep it warm and melty for a longer period of time (say while you're watching a game) I have two suggestions. First, is dumping the finished queso into a teensy 1.5 Quart Slow Cooker to keep it warm. One of the advantages of this is the warm setting & the lid if you want to take a break from the queso do snack on something else. It's big enough to hold the 4 cups of dip but small enough that it won't take up a ton of space. Second, is pouring the cheese dip into a mini cast-iron skillet with a fabric hot handle holder or silicone hot handle holder that's been warmed in the oven first. If you've ever been to a Chili's restaurant & eaten their beef queso that's how they serve it. You just have to be careful not to get the skillet TOO hot beforehand or it will scorch the bottom of the queso as it goes into the pan. I created this recipe over three years ago and since then, it's grown in popularity on Pinterest and quite a few folks have shared their feedback in the form of comments and uploaded pics. This queso was amazing! We devoured the whole thing. It was okay but it was too thick for my liking. Had to add some extra cream or broth to thin it out. I didn't like it - too much cream cheese. Next time I'd add all shredded cheese. It's true that this is a thicker queso dip and that's not everyone's cup of tea. And some folks aren't big fans of cream cheese. If you're into a thinner dip, add the 1 1/2 cups to start out with and after all the cheese is incorporated, if it's still too thick for you, slowly stir in another 1/4 cup (or more) of cream until it's thin enough for you. If you're not into cream cheese, simply omit that and add an extra 4 ounces of shredded cheese to the dip (either cheddar or pepper jack). If you like it super cheesy, you could even add another 4 ounces on top of that. If you're a visual learner, make sure to watch my short recipe video by clicking below. 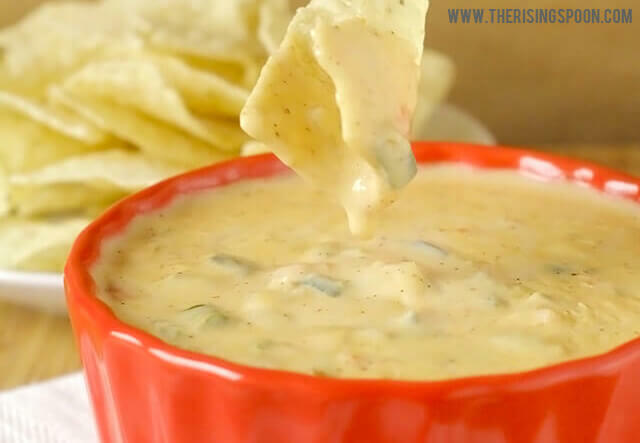 It shows just how easy it is to make homemade queso dip! Looking for more appetizer ideas? Check out my appetizer recipes index! Click Here To Pin This To Your Appetizer Recipes Board On Pinterest!